Free Comic Book Day: May the Fourth Be With You! Celebrate comic books and Star Wars at this free event! Meet artist Galen Showman and author Marc Sumerak! Galen Showman is an award-winning artist who has worked in comics for over twenty years. He has often collaborated with P. Craig Russell, beginning with I PAGLIACCI for Dark Horse Comics and JUSTICE LEAGUE: AGE OF WONDER for DC Comics. His other credits include STAR WARS, HELLBOY, The Graveyard Book graphic novel, and the Eisner Award-winning anthology Little Nemo: Dream Another Dream. His most recent work appears in the graphic novel adaptations of Lois Lowry’s The Giver and Neil Gaiman’s American Gods. Copies of Mr. Showman's work will be available for purchase and signing. Marc Sumerak is a freelance comic book writer from Cleveland, Ohio. 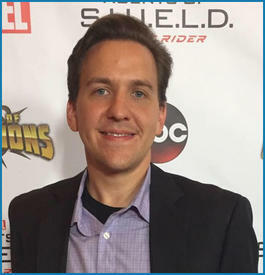 Sumerak is known for his work on Marvel Comics' all-ages Power Pack series, as well as the Eisner Award & Harvey Award nominated Franklin Richards: Son of a Genius, and has contributed as Writer and Editor to hundreds of mainstream comic books and related publications, including runs on AVENGERS, FANTASTIC FOUR, THOR, IRON MAN, GUARDIANS and many more! Sumerak continues to write comics, books, video games, and more for some of pop culture's most recognizable franchises -- including STAR WARS, HARRY POTTER, FIREFLY, GHOSTBUSTERS, and BACK TO THE FUTURE. Copies of his new book Star Wars: Droidography and others will be available for purchase and signing. Mr. Sumerak's appearance is subject to availability. There will also be many FCBD free comic books available to pick up, courtesy of JC Comics and Cards in Cuyahoga Falls (while supplies last). This event is co-sponsored by the Friends of the Library, JC's Comics and Cards, and The Learned Owl Book Shop.